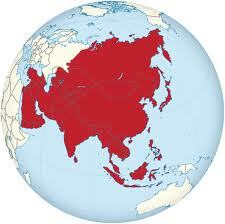 Asia is the largest continent among all the seven in terms of area and population.It has almost 60% of the world's population with the two most populous countries (CHINA & INDIA) in it.It is surrounded by Pacific ocean in the east,Europe in the west,Indian Ocean in the south and Arctic ocean in the north. Major languages of Asia are Chinese,Hindi, Korean,Japanese.It is a home to various religions like Hinduism,Buddhism,Islam,Christianity,Taoism etc. A few of many great cities being Beijing, New Delhi, Shanghai, Tokyo, Seoul, Jakarta, Bombay etc. Here is a list of all the 51 countries in it.